NASA's Juno mission arrives at Jupiter on July 4, 2016. The orbiting spacecraft will use special instruments to peer beneath the swirling clouds, unlocking secrets about the planet and the entire solar system. Mission Juno website - A rich multimedia experience designed to share the story of Jupiter and the Juno mission with a wide public audience. Eyes on Juno - Fly along with Juno! NASA's Juno mission is part of NASA's 3D interactive, Eyes on the Solar System. The Eyes on the Solar System interface combines video game technology and NASA data to create an environment for users to ride along with the Juno spacecraft. Why With Nye video series - Why With Nye features Bill Nye demystifying the cutting edge science behind NASA's Juno mission to Jupiter. Watch Nye bring the Juno mission to life with his signature blend of props, performance, and solid scientific know how. Juno page on NASA.gov - NASA's official site. Explore: Jupiter's Family Secrets! - A set of informal education activities, adaptable to any afterschool environment. Designed by the Lunar and Planetary Institute (LPI), for the Explore! Library program. Juno Citizen Science - JunoCam is Juno's visible-light camera specifically designed to engage the public by providing dramatic, close-up color views of Jupiter. The public will be involved in processing the images from raw data and even helping the science team determine which areas of Jupiter should be imaged by the spacecraft. The Goldstone Apple Valley Radio Telescope (GAVRT) program. Students use a former NASA Deep Space Network antenna to do real science. 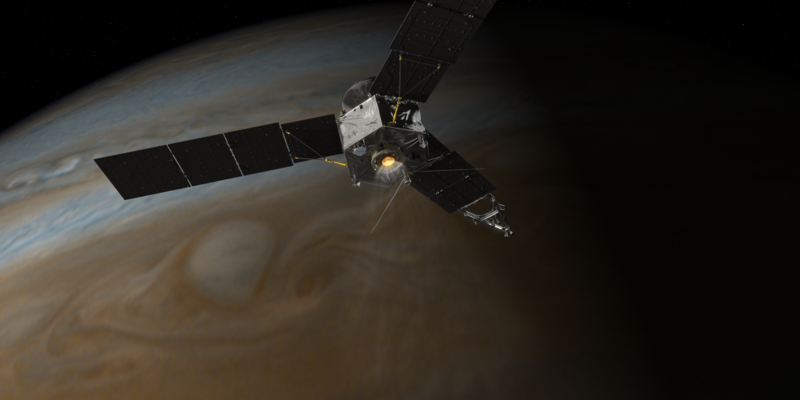 The GAVRT program teams students with scientists to conduct cutting edge research, including monitoring Jupiter to support the Juno mission. Training and resources to benefit NASA Nationwide, a consortium of formal and informal education networks, which includes the Solar System Ambassadors program. SpaceMath@NASA, a resource for teachers that explores math concepts related to mission events and discoveries announced in recent NASA press releases. Since 2004, its math problems have been downloaded more than four million times. Printed items such as mission fact sheets and posters are available for educators and astronomy groups, subject to availability. Contact Juno's outreach team to inquire. More details will be added as they become public.